How have Canada and Norway managed climate change? Both Canada and Norway are major petroleum exporters, producing roughly the same volume of oil and gas. Conservative governments hold power in both countries—Canada’s in majority and Norway’s as part of a centre-right coalition. Despite these similarities, the governments are worlds apart when it comes to climate change. 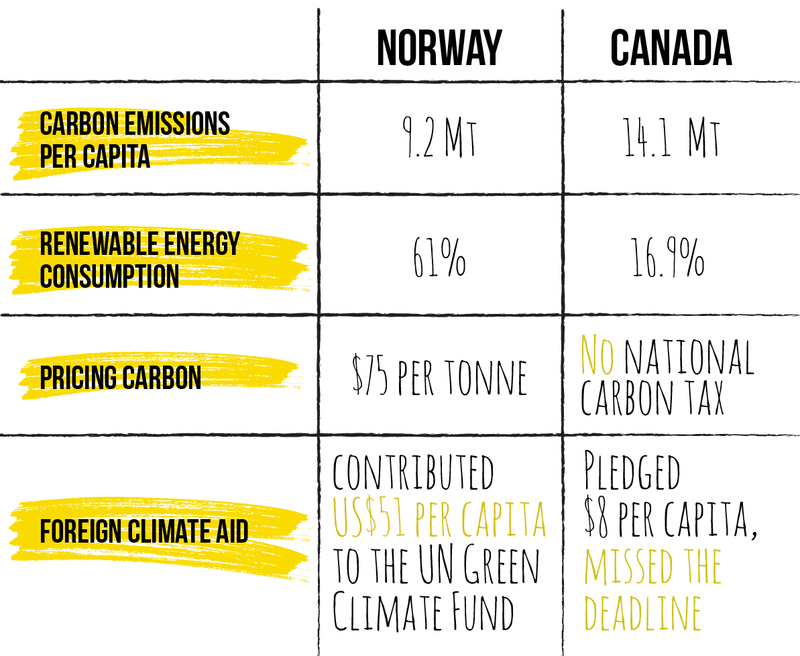 Norway emits two-thirds as much carbon per capita as Canada: 9.2 Mt vs. 14.1 Mt. Canada has the third highest GHG emissions per capita of 17 OECD countries ranked. If Alberta were a country it would have the highest per capita emissions in the world, on par with Qatar. Almost two-thirds (61%) of Norway’s energy consumption is from renewables (mainly hydro), with plans to reach 68% by 2020. In Canada, renewable energy resources provide 16.9% of our total primary energy supply. There is no national plan to increase the use of renewables. Under the first period of the 1997 Kyoto Protocol, Norway exceeded its commitments by 10 percentage points. Under the second commitment period, Norway promised to reduce greenhouse gas emissions by 30% below 1990 levels by 2020. Under its 2015 Paris commitments, the Norwegian government has pledged reduce greenhouse gas emissions by at least 40% below 1990s levels by 2030, and be carbon neutral by 2050 at the latest. In Kyoto, Canada committed to reducing GHG emissions to 6% below 1990 levels by 2012. By 2008, Canada’s emissions were 24% above 1990 GHG levels—due in no small part to an increase of 66% in Saskatchewan and 53% in Alberta since 1990. In 2011, the Conservative government withdrew from Kyoto—the only signatory country do so. Canada refused to endorse Germany’s pledge for G7 countries to be carbon-zero by 2050, alongside Japan. As a result, at their June 2015 meeting, G7 leaders were obliged to endorse a much weaker goal, namely to eliminate fossil fuel use by 2100. Norway recently doubled its carbon tax on the oil industry to $75 per tonne, and the country has joined the European GHG trading emissions regime. Norway’s parliament directed its trillion-dollar sovereign wealth fund to divest from companies taking more than 30% of their revenues or power production from coal. The Norwegian government brought in a number of incentives to encourage the use of electric vehicles, including the availability of free public charging stations, toll-free roads and ferries, and allowing electric car to use bus lanes. Norway has become the world’s largest electric car market with a 14% market share in 2014. With Canada’s hodgepodge of provincial incentives, it is hardly surprising that plug-in electric vehicles accounted for 0.27% of total vehicle sales in 2014. Canada’s new rules for coal-fired power plants are weak. They only apply to those built after 2015. Existing plants built in the last 50 years are grandfathered, meaning they will not have to take any emissions reduction measures until 2030. The Harper government has cancelled almost 3,000 en­vironmental reviews, including 678 about fossil fuels and 248 dealing with pipelines. These measures will accelerate oil sands development and Canadian carbon emissions. The IMF estimates total petroleum subsidies in Canada in 2011 to be $20.23 billion. Canada provides more subsidies to petroleum as a proportion of government revenue than any developed nation except the United States and Luxembourg. The IMF report estimates that eliminating the subsidies would reduce carbon emissions by 13%. Norway pledged and sent its contribution of US$258 million (US$51 per capita) to the Green Climate Fund, established by the UN to help developing countries adapt to and mitigate the effects of climate change. In addition, Norway contributed $US1 billion to the Brazilian Amazon Fund in recognition of the South American nation’s outstanding results in reducing Amazon deforestation over the last decade. Canada pledged US$277 million ($8 per capita) to the Green Climate Fund, but missed the April 2015 deadline for sending its contribution. Canada announced in 2013 that it was pulling out of a United Nations convention that fights climate change–induced droughts in Africa. Canada is the only country in the world to have pulled out the agreement. Bruce Campbell is the Executive Director of the Canadian Centre for Policy Alternatives, and the author of the report The Petro-Path Not Taken: Comparing Norway with Canada and Alberta’s Management of Petroleum Wealth. Maybe if the Canadian Government approved safe, new, certified Pipelines to World Markets and stood up for a FAIR Canadian BBL price under the USMCA Agreement, Canada would have an economy that could fund Climate Policies…. but the Left have failed Canada, they are trying to squeeze blood from a stone, they need to help us MAKE money, not just TAKE our Money! Fossil Fuels and Oil are used by everyone, everywhere, for everything including GREEN Energy, they are a cure and not a curse at all and by working together, the World can be Canada’s Oilster and Canada can be the World’s Oil Store! The fact is, we will never get to the Future, by restricting our evolution to the energies of the Past! We need optimization and innovation with Capable Energies, not just inefficiency and subsidies with Incapable Energies!